I pray that this year has been kind to you and yours, and that this summertime will bless you with health and adventure. This year was good for my butterfly safari. Not quite ready for a deck chair! Many planes and airports to butterfly farms in the islands of Palawan and Busuanga and trecking (lost fifteen pounds!) into the steaming Amazon Jungles of Argentina, Paraguay, and Brazil. 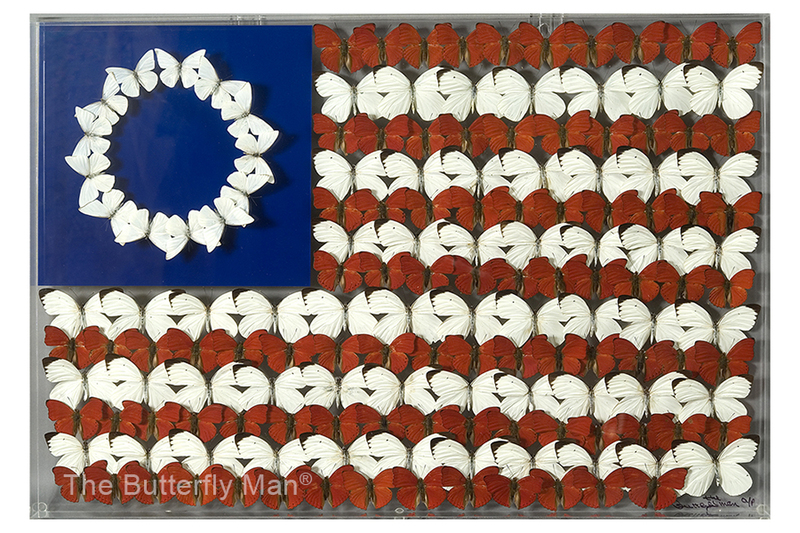 Along with pictures of these places, my butterfly American Flag will be on display, along with limited new “Butterfly Waves”, my traditional heirloom wood frame line, and of course my original mini butterfly cubes. This 2018 display is at The Sawdust Festival; 935 Laguna Canyon Road, Laguna Beach CA 92651. Open June 29th to Sept. 2nd seven days a week, 10:00 am to 10:00pm. My “shoppe” number is 312. Please call to find out my schedule. I would love to see you this summer! 949-494-3635.